Enjoy reduced rates at select Hilton Hawaii Hotels & Resorts. 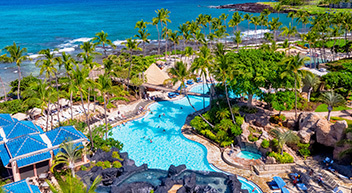 Book a flight + hotel vacation package to Hilton Hawaii Hotels & Resorts, and take advantage of reduced rates at select resorts. Restrictions and exclusions may apply. Hotel offer is valid in select room categories. Look for the Paradise Made Simple messaging next to your room selection at the time of booking to get this offer. Service from San Jose, CA, to/from Honolulu begins 5/5/19. Service between Oakland and Kona, and San Jose, CA, and Kona begins 5/12/19. Unique village-style resort set in 22 acres of oceanfront paradise including nightly, live Hawaiian entertainment, numerous pools and swimming lagoon, and its famous weekly Friday night fireworks show. 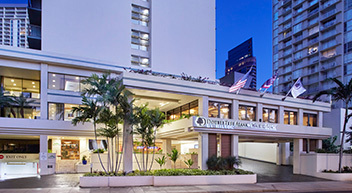 A modern retreat at the entrance to Waikiki and within walking distance to Ala Moana Shopping Center, this boutique hotel welcomes all guests with its signature chocolate chip cookie. Set on the sunny Kohala Coast on the Island of Hawaii, this spectacular oceanfront playground features air-conditioned trams and mahogany canal boats to take you throughout the beautifully landscaped resort grounds, championship golf, and numerous activities for all ages.